Although this year's Frieze London art fair, which continues to Sunday 7 October, feels a little more restrained than usual, there's still room for wildly odd and raucously sardonic works. Chris Sharratt reports from the Regent's Park tent. 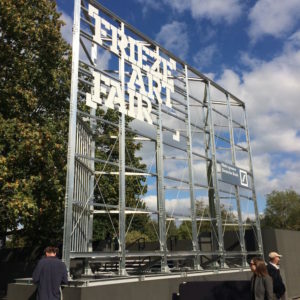 There’s something a bit on the restrained side about this year’s Frieze London. Big gestures are out – mostly – and there’s thoughtfulness and a sense of human scale in much of the work. If that sounds slightly dull, a bit risk averse, it isn’t meant to. In fact some of the work is wildly odd – and all the better for it. Hong Kong artist Wong Ping’s work is definitely a bit strange, but it’s also infused with dark humour and a savvy eye for social anxieties. He’s the inaugural winner of the Camden Arts Centre Emerging Artist Prize, a new initiative for the Focus section at Frieze which awards the recipient a solo show at the north London gallery – an intriguing prospect judging by Ping’s presentation at Edouard Malingue. 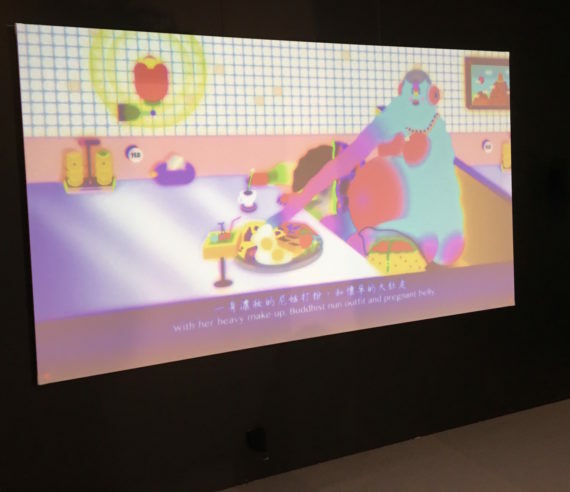 His garishly-coloured animated film, Wong Ping’s Fables 1, has an old-school computer game aesthetic and a cast of socially awkward non-human characters – a physically impaired chicken, a blind singing elephant, a super-sized turtle. The film is narrated in Chinese with English subtitles and the whole thing is simmering with a kind of social media-fuelled anxiety and neediness. It’s a weirdly disconcerting ride complemented by 3D printed sculptures – I loved it. There are more strong presentations in the Focus section, which consists of galleries under 12-years-old and artists that are mostly in the early stages of their practice. At Mumbai’s Jhaveri Contemporay, Glasgow-based, Birmingham-born Hardeep Pandhal’s ‘Decolonial Dungeon Mastery’ packs eight new works into another tiny booth. It feels like a proper – if small – exhibition, a mixture of drawings, animated video and knitted sculpture that digs and probes at colonial legacies and entrenched ideas of white superiority. Typically for Pandhal, it’s raucously sardonic, visually vibrant and bleakly funny. I spent a lot of time in this part of the art fair, which is tucked away at the back of the Frieze London tent and features 33 galleries from a fair total of over 160. Other stand outs include San Francisco-based artist Josh Faught’s textile collages at Koppe Astner gallery. 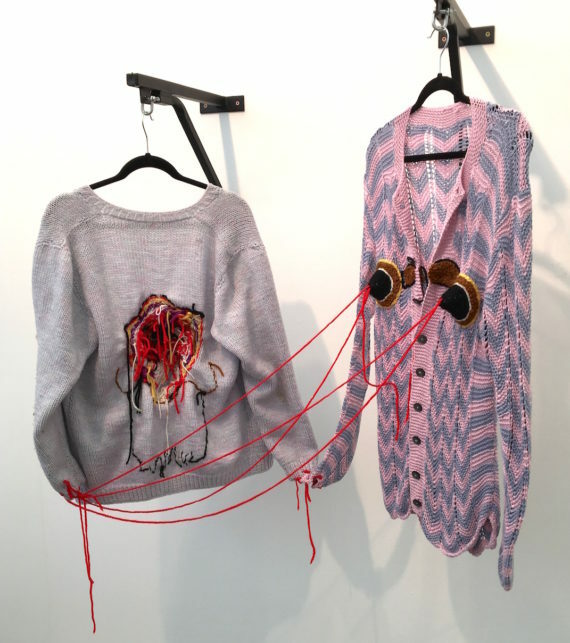 Exploring queer identities and lifestyles, his rough around the edges wall-based works, with loose dangling threads and hand-drawn or embroidered text, suggest fracture, messiness and joy. A series of three small gouache on cardboard paintings of buildings by Paris-based Louise Sartor at Galerie Crevecoeur also deserve a mention. Beautifully executed and slightly mysterious, they left me wishing for a whole room of her controlled, compact depictions. More from Chilean artist Johanna Unzueta would be welcome, too. 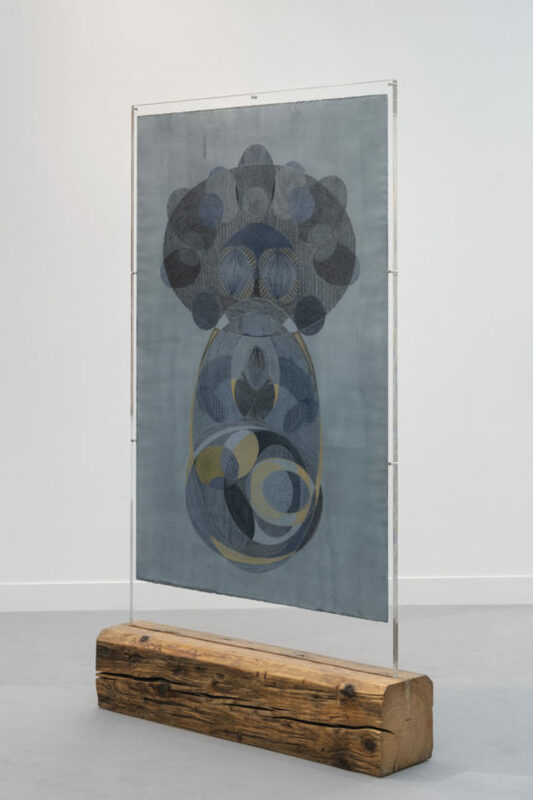 Her oddly somber, textile-like patterned drawings at Guatemala City gallery Proyectos Ultravioleta’s booth are displayed as free-standing sculptural objects – mounted between two pieces of Plexiglass with a wooden base made from recycled beams. 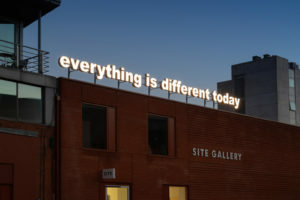 Three of them have been bought by the Tate Frieze Fund – a reminder if needed that as well as sales being made, art world relationships are cemented and career trajectories plotted in the art fair cauldron. Away from Focus, there’s an ‘Acquired by the Tate Frieze Fund’ sticker at the Hollybush Gardens stand, too, this time for a large pastel and gouache painting by Claudette Johnson, Standing Figure with African Masks (2018). It’s part of a well conceived presentation that includes ceramics by Lubaina Himid and prints from Charlotte Prodger and Andrea Büttner – a bit of a Turner Prize 2017/18 get together in fact. Whether by accident or design, there’s a neat symmetry to the placing of Johnson’s painting on a wall opposite Apalazzo’s booth, one of eight galleries in the themed Social Work section. 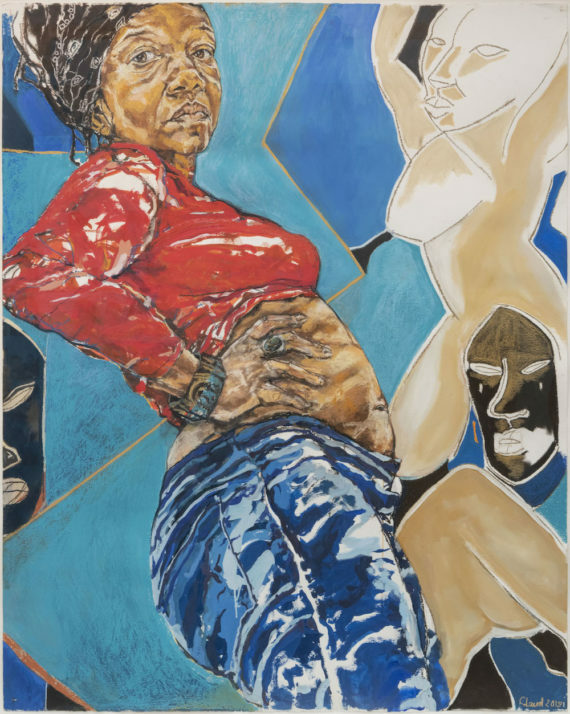 Featuring solo presentations by female artists making politically charged work in the 1970s to ’90s, Apalazzo’s artist is Sonia Boyce, a contemporary of Johnson and like her a key figure in the emergence of the black British art movement in the 1980s. The piece on display, Boyce’s black and white photographic work The Audition (1997, printed 2018), is another acquisition for the Tate collection. Also part of Social Work, Helen Chadwick’s 1977 photographic series, In The Kitchen, which features the artist as various domestic appliances – a fridge, oven, washing machine – recalls the struggles of an era that saw entrenched gender roles pushed aside by artists such as Chadwick. Nearly a decade later, Mary Kelly’s Interim Part 1: Corpus, (1984-85) addresses in text and fashion-style photography the trauma of invisibility inflicted on middle-aged women. While much has changed since the work was made, it still feels hugely relevant. 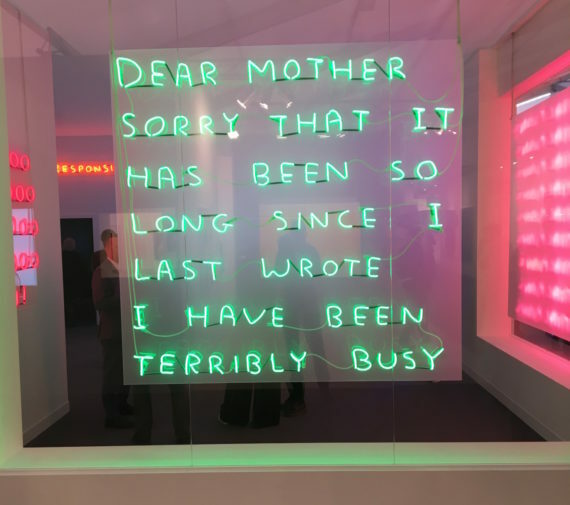 Other highlights from the rest of the fair include Caroline Walker’s unsettlingly voyeuristic paintings of female hotel maids and cleaners, presented at Grimm gallery; the simplicity of David Batchelor’s concrete and paint tin lid sculpture (Geo-Concrete 03, 2018) at Ingleby Gallery; Ana Mendieta’s 1972 work Untitled (Facial Hair Transplants) at Galerie Lelong & Co; and David Shrigley’s very funny antidote to artword seriousness at Stephen Friedman Gallery, with text-based neons including the convincingly-put statement: ‘My artwork is terrible and I’m a very bad person’. Works by Mounira Al Solh, Akram Zaatari and The Atlas Group / Walid Raad, all at Beirut’s Sfeir-Semler Gallery, also made me slow down and linger – for both their visual intrigue and the stories they told or suggested. Raad’s work, I want to be able to welcome my father to my house (1990/2018) consists of 10 chromogenetic prints of his father’s diary, each representing a week during the Lebanese Civil War. The artist has drawn ten images of different types of munitions in the centre of each diary page, nestling among entries about Syrian bombs and friends’ houses being destroyed. From afar, though, they have the look of botanical drawings, the reality of their source becoming clearer as the text is read. 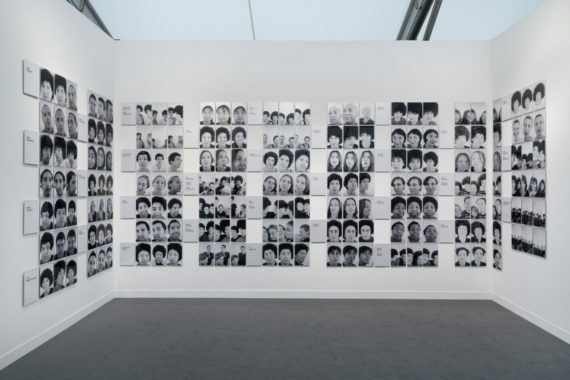 If there is a broader theme that emerges from the works on display at this year’s Frieze – and having navigated so much in such a short space of time it’s wise not to overplay such things – it is perhaps a sense that what was previously marginalised is becoming more visible, moving centre-stage. Whether that’s artists of colour, women or LGBT artists, there is an increased diversity of voices and experiences being reflected in the work commercial galleries are choosing to show. The art market, and art institutions, are catching up.